Morgan Robinson is a senior at H. B. Plant High School in Tampa, Florida, and will graduate with a 6.29 grade point average. Morgan has challenged herself by taking a course load consisting of many honors level classes as well as eleven advanced placement courses. She maintained balance by also dedicating her time to participating in numerous school activities. Morgan is the vice president of chorus, the secretary of Best Buddies, the Online Content Editor for pepoplant.com, her school newspaper’s website, social media captain for First Priority, a Christian club, a writing tutor in her school’s writing center, and an active member of several other clubs and organizations throughout her school. 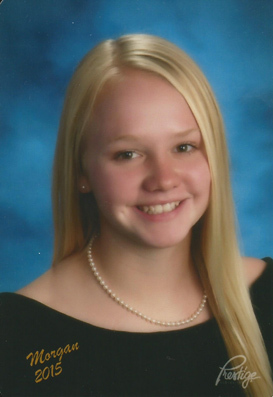 In addition, Morgan was a member of both the varsity soccer and flag football teams. Morgan is committed to giving back to her community. She volunteers at the Children’s Cancer Center and participates in annual Relay for Life events. She has also served as a leader within her church youth group for years, giving her time as both a mentor to younger students and a lead singer in the worship band every Wednesday night. Morgan has been accepted at the University of Florida and the Georgia Institute of Technology and plans to attend one of these institutions in the fall to major in Biomedical Engineering. Morgan is the daughter of Driver Engineer Tim Robinson and wife, Sarah.